The longer one waits in between posts, the less likely it is for anything to seem “write-worthy”. The world is going to hell, so how can I write about recipes, gardens, planting garlic, getting rid of groundhogs, drying herbs, trying to write a novel, or working on a bathroom? Devastating floods in Houston, Florida, Puerto Rico, earthquakes in Mexico, mass murders in Las Vegas, terrifying fires in California — puts all that other puny unimportant stuff in perspective, doesn’t it? I have nothing important to say, except God have mercy on us. Listen to this beautiful version of Trisagion by Fernando Ortega. The earth awakens from sleep. So what happens when one finally gets settled into a routine at the cottage where one has spent three years preparing to live? There’s a volunteer commitment one made before the new job happened. There’s cooking to do, gardens to plant, flowers to grow, pillow covers to make, Bible to study, VBS to get ready for, neighbors to visit, friends to talk to, firewood to haul, and, yes, there are still boxes to unpack, files to organize and a room to paint. As well as the bathroom to gut and redo, and the back porch to finish. And suddenly, there’s no time to write. Ha, silly me. I thought perhaps after we moved here, I’d have spare time to finish that novel… Now I can’t even find time to write 500 words for a blog post. It’s the rhythm of life. Suddenly there is much going on, but it is the routine of day-to-day, interspersed here and there with a gorgeous full moon, the bloom of a new starburst flower, the scent of peonies, a gentle sunrise. But that is life, isn’t it? Making the most of those boring bits of life in-between the great, amazing stuff that, if we are honest, doesn’t really happen all that often. It’s what we do with the routine and the interruptions to our routine that are important. Read this C.S. Lewis quote and put it on your fridge. 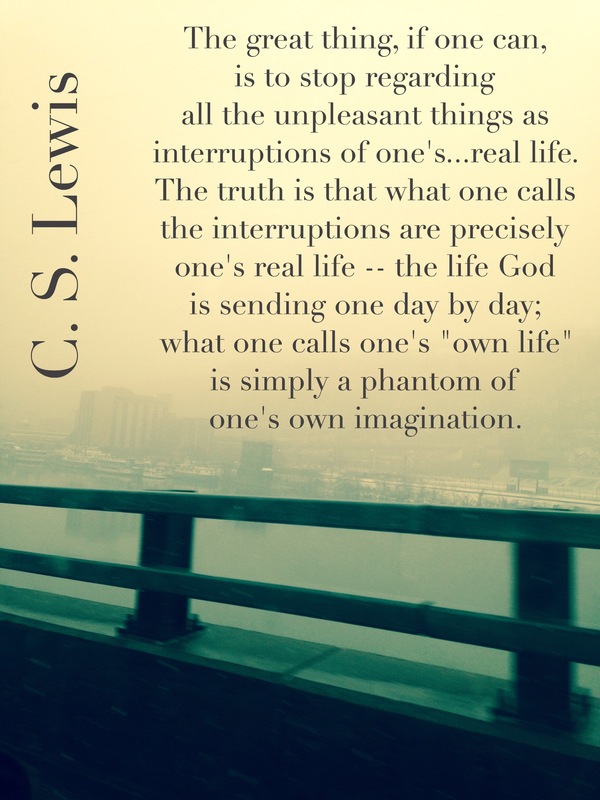 Yes, the unremarkable, the humdrum, the commonplace — that’s the life God is sending us. And do we sing on the way to work, or grump about the trucks that are making us late? Do we gripe about having to fix dinner on a day when we don’t get home until 6:00, or do we look into the fridge and make it a game with ourselves to come up with the best we can with what’s there? and he graciously gives us new eyes to see beauty in the familiar.